Called Hewes and they recommended lag screws and I think I'm going to go with that. Don't really want to cut access in everything. 2" screws on the top two holes and 2 1/2" on the bottom two. Starboard wedge fits perfect. 5200 or 4200??? Thoughts?? This is the trailer that came with the boat when I bought it last year. The trailer is in excellent condition but obviously way too short. I'v been looking around for a good used trailer but have no idea what length I should be looking at. 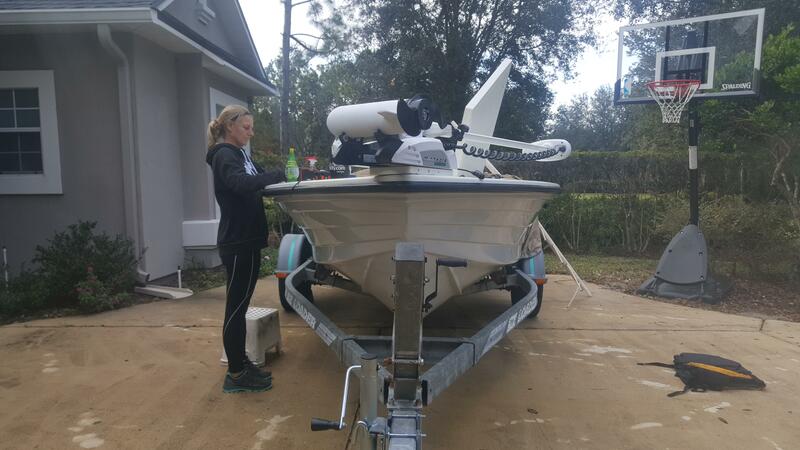 What do you have your boat sitting on? Thanks. Sad thing is I've only been out 4 times. Baseball, football, yardwork, and then start all over again. That's my thought. Take it and have it modified. Should I use a washer on the transom mount lag screws? Did you mount your Fire Extinguisher? This is how it's mounted on my 92 Redfisher. Sit's in there nice and tight. FYI there's a new fresh one on the boat. I have a 92 Redfisher that I picked up last fall and would like to replace the entire plumbing system in it. Besides the original hardware being 27 years old, the original owner replaced all the hoses with garden hoses. I just don't trust it. Is this something I could do myself? I'll add more pictures over the next couple of days.